So I hit the Sephora Sensorium interactive exhibit on W. 14th Street this weekend. Subtitled “Lucid Dreams from the Sensory World,” the show opened in early October, and will close on November 27. It basically consists of a loop to the far end and back of a narrow retail popup space in the Chelsea Market. The initial Perfumology section has a timeline of perfumery painted along one wall; it’s rather perfunctory (Cleopatra, Mitsouko, Justin Bieber, yadda yadda) and literal (it’s a . . . line). Opposite the wall are an interesting hodge-podge of artifacts, including a 1950s coin-operated perfume vending machine, which I’ve blogged about but never seen in real life (it’s smaller than I’d imagined). There are beautiful glass cylinders filled with perfumery raw materials, and screens playing brief videos about topics such as the relation of top, middle and base notes to molecular volatility. This section also has the show’s best interactive display: a round table on a base. The table surface is divided into quadrants, each illustrated with a gorgeous color photo: red pepper corns, star anise, etc. Each quadrant has a button-activated nozzle; you lean over, immersed in the image, and get a stream of air carrying the wonderful scent of the raw material. I’ve seen a lot of scent-delivery exhibits and this was one of the best executed. Too bad star anise is about to be dialed out of perfumery due to the corporate statism of IFRA and the EU regulatory state. The next section—Senseless—is set of sound-dampened “isolation booths” where you don headphones and listen to voices narrating the depressing experience of anosmia. Although it does have a clever experiential twist at the end—involving a cherry lollypop—I’m puzzled that so much exhibit time is spent on the absence of smell. At the top of the back stretch comes Life at First Scent, sculptures and assemblages that are spot-lit one by one, with accompanying projected video background and scent release. For example, a lifelike bronze sculpture of a squirming octopus is accompanied by the scent of salt air and sea mist. Interesting, not awesome. On through black curtains to the Lab of Emotion, a darkened space with wall-mounted chemistry glassware percolating away, while videos play behind glass domes. Four displays presented different emotions, and each display had three or four scent sampling ports. Inserting your hand into the port dispensed a scent. At least I think that was the idea—the ports were too low to bend over and sniff conveniently, and there were several which didn’t seem to be dispensing. There was a lot of text on each display, which prompted the relevant emotion, described the scent, and identified the perfumer. For me, the visual preoccupation with the text detracted from the olfactory experience. This tends to be an issue with most interactive smell exhibits; it’s not easy to balance spontaneity and scent with verbal/textual messaging. Lucid Dreams, the next darkened space, was four, small, illuminated sniffing globes. The air pressure changes caused by your sniffing trigger spacy, abstract videos back-projected on a scrim behind the globe. Here the exhibit design was excellent—no bending over, very little text—but the fragrances themselves were disappointing. They were tame and indistinct and lacked the trippiness of the visual images. From Lucid Dreams, one emerged into the light and the Fragrance Bar. This was literally set up like a bar, complete with stools. On the counter were four color coded trays, each carrying six overturned, stemless wine glasses. An absorbent scent sticker the size of a quarter was stuck to the bottom (= upended top) of each glass. One sampled the fragrance—the drydown of an actual, commercial perfume—by upending the glass and sticking your nose in it. Clever, yet simple. This setup is lifted from the wine business, where you cover a glass of wine with a flat plate, and lift it to sample the accumulated aroma of the wine. In the Fragrance Bar, each tray with its flight of six glasses represented a different theme: playful, polished, casual, and addictive. You could make sniffing notes in a little booklet, and if a scent struck your fancy the bar tender (in my visit a well-informed retail guy who works at Sephora) identifies the brand and offers to sell you a bottle. The Fragrance Bar uses drydown notes for practical reasons—how would you constantly refresh top note samples?—and for consumer reality: you enjoy top notes briefly, but live with the drydown for the rest of the day, so it’s important that you like it. Sniffing two dozen drydowns in a row was quite an experience, and the results were shocking. Where a top note sampling would have been a parade of different come-ons (sweet, fruity, spicy, aldehydic, etc. ), the base notes were of a much narrower olfactory range. They were far less individually distinctive, often muddled. That the Jennifer Aniston perfume, with its literal-minded evocation of sunscreen, stood out tells you something about the state of modern perfumery. Enormous effort goes into designing the short-lived top notes that leap from the bottle and grab your nose and credit card. The heart gets some attention, if only as a pleasing transition. But drydown is almost an afterthought, murky and indistinct. Perfumes for the age of short attention span. Hats off to Sephora and Firmenich for providing some entertainment, education and provocation, and for offering the largest blind sampling of commercial fragrances you’re likely to encounter. The $15 admission fee becomes a gift credit at Sephora, so it’s really a freebie for fragrance fans. Thanks for the description of this event. 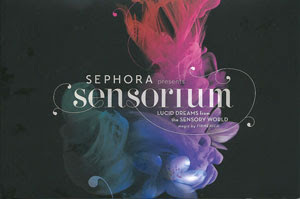 I'm not too excited by any of the perfumes on offer at Sephora, so I thought it would be boring, but it sounds like fun. It was fun. And I applaud both companies for going out there and actually putting scents under nostrils to get the conversation started. Thanks, Avery, I really appreciate the information about this event. As a follow-up could you tell us the small set of base notes in the 24 drydowns? And do you think there were so few because of restrictions, ingredient costs, or customer preferences?